Ceftriaxone belongs to the family of antibiotics known as cephalosporins. It is used to prevent or treat certain infections caused by bacteria. It is given by injection only into a muscle or vein. Ceftriaxone is often used to treat infections of the lung, urinary tract, skin, abdomen, bone, joint, and lining of the brain (meningitis), depending on the bacteria causing them. It can also be used to treat gonorrhea (a sexually transmitted infection). Each vial contains white to pale yellow powder equivalent to ceftriaxone 250 mg. The sodium content for each gram of ceftriaxone is approximately 83 mg (3.6mEq sodium ion). Nonmedicinal ingredients: none. Each vial contains white to pale yellow powder equivalent to ceftriaxone 1 g. The sodium content for each gram of ceftriaxone is approximately 83 mg (3.6mEq sodium ion). Nonmedicinal ingredients: none. Each vial contains white to pale yellow powder equivalent to ceftriaxone 2 g. The sodium content for each gram of ceftriaxone is approximately 83 mg (3.6mEq sodium ion). Nonmedicinal ingredients: none. To treat bacterial infections, the recommended dose and dosing schedule of ceftriaxone varies according to the specific infection being treated, the response to therapy, and other medications or treatments being used. The dose administered is also based on age, body size, and kidney and liver function. For moderate to severe infections in adults, the dose ranges from 1 g to 2 g daily given once every 24 hours or divided into 2 equal doses and given every 12 hours. For uncomplicated gonorrhea in adults, one dose of 250 mg is injected into a muscle. For children 12 years of age and under, the dose is based on body weight and is given every 12 hours. The maximum daily dose for adults and children is 4 g. The duration of treatment depends on the type of infection and usually ranges from 4 to 14 days. Some infections require only one dose while others require treatment for several weeks. 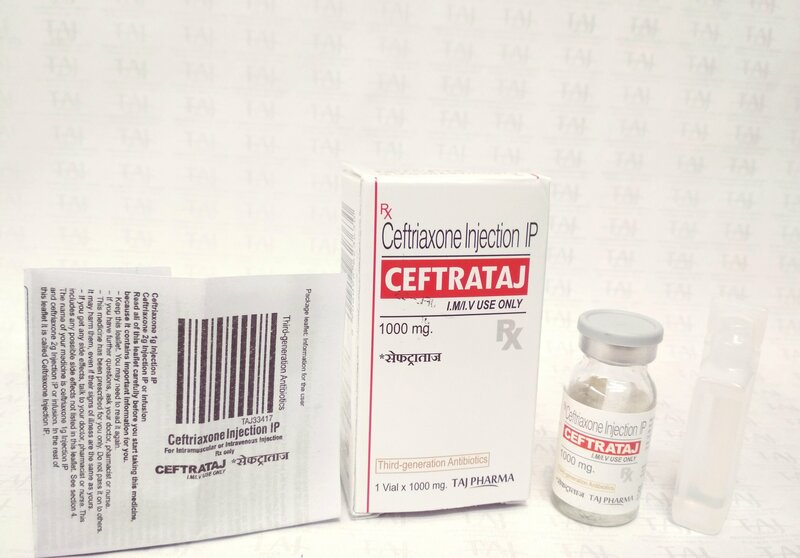 Ceftriaxone is injected into a vein or into a muscle by a health care professional under the supervision of your doctor. Many things can affect the dose of medication that a person needs, such as body weight, other medical conditions, and other medications. If your doctor has recommended a dose different from the ones listed here,do not change the way that you are taking the medication without consulting your doctor. Store this medication (as unmixed vials) at room temperature, protect it from light, and keep it out of the reach of children. Do not give this medication to a newborn or premature infant who has high amounts of bilirubin in their blood. Do not give this medication to a newborn who is receiving (or expected to receive) calcium-containing intravenous solutions (calcium-containing solutions should not be given within 5 days of ceftriaxone in infants up to 10 weeks of age). Some people may experience side effects other than those listed.Check with your doctor if you notice any symptom that worries you while you are taking this medication. Allergic reactions: Ceftriaxone can cause severe allergic reactions. If you develop symptoms of a severe allergic reaction (hives; difficulty breathing; swelling of the mouth, tongue, or throat), get immediate medical attention. Anemia: Although rare, certain drugs can cause a blood condition called hemolytic anemia, where people have low red blood cells due to premature destruction of this type of blood cell. If you have a history of cephalosporin-related hemolytic anemia, you should talk to your doctor before starting treatment. Blood tests: Depending on various factors, including how long you will be receiving treatment, your doctor may order blood tests while you are taking ceftriaxone. Calcium-containing solutions: The interaction with calcium-containing solutions has only been reported for newborns. For all other people, ceftriaxone can be administered before or after calcium-containing solutions provided that the infusion lines are flushed well in between the solutions. In newborns, calcium-containing solutions should not be given within 5 days for infants up to 10 weeks of age. Gallbladder disease: If you have gallbladder disease, discuss with your doctor how this medication may affect your medical condition, how your medical condition may affect the dosing and effectiveness of this medication, and whether any special monitoring is needed. Kidney problems: Ceftriaxone may cause kidney stones. If you have high calcium levels in your urine or a history of kidney stones, discuss with your doctor how this medication may affect your medical condition, how your medical condition may affect the dosing and effectiveness of this medication, and whether any special monitoring is needed. Low vitamin K: People with impaired vitamin K synthesis or low vitamin K stores (e.g., chronic liver disease and malnutrition) may require monitoring of blood clotting during treatment, as ceftriaxone may decrease clotting ability. Overgrowth of organisms: Treatment with this antibiotic may allow normal fungus or types of bacteria not killed by the antibiotic to overgrow, causing unwanted infections. Stomach and bowel disorders: If you have stomach and bowel problems (especially colitis), discuss with your doctor how this medication may affect your medical condition, how your medical condition may affect the dosing and effectiveness of this medication, and whether any special monitoring is needed. Breast-feeding: Ceftriaxone passes into breast milk in small amounts. If you are a breast-feeding mother and are taking ceftriaxone, it may affect your baby. Talk to your doctor about whether you should continue breast-feeding. Children: Newborn and premature infants (up to the age of 10 weeks) should not receive calcium-containing solutions within 5 days of receiving ceftriaxone. Taj Generics (Taj Pharma) provides a wide range of products to the Indian market, including an extensive range of generics and specialty products; Our products cover a vast array of therapeutic categories, and we offer an extensive range of dosage forms and delivery systems including oral solids, controlled-release, steriles, injectables, topicals, liquids, transdermals, semi-solids and high-potency products. Our Generics portfolio offers over 1500 products in the major therapeutic areas of gastro-intestinal, cardiovascular, pain management, oncology, anti-infectives, paediatrics and dermatology.